Machik Labdrön (Tib. མ་ཅིག་ལབ་སྒྲོན་, Wyl. ma cig lab sgron), the 'Sole Mother' (1055-1149/53) — the female master who, with Padampa Sangye, initiated in Tibet the lineage of the practice of Chö, which means ‘cutting through’ ego-clinging and other attachments. 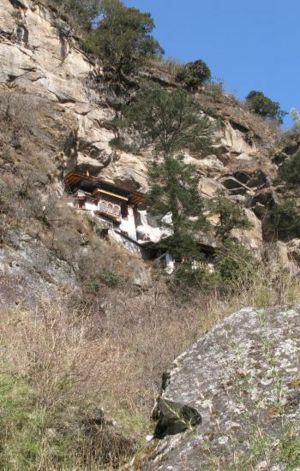 Machik Labdrön and Padampa Sangye stayed for some time in Bhutan near Taktsang Monastery. Their meditation caves can still be found. A temple has been built at the place of Machik Labdrön's meditation cave. The rocks nearby are said to contain termas hidden there by Machik Labdrön. Machik's Complete Explanation, translated and edited by Sarah Harding, Snow Lion Publications, 2003. Jerome Edou, Machig Labdron and the Foundations of Chod, Snow Lion Publications, 1995. This page was last edited on 22 November 2017, at 01:28.